Pearls have played a major role in bridal fashion for centuries. Not only do pearls add an instant dose of sophistication to any bridal look, but they can also hold sentimental value, often being passed down from generation to generation. Bridal pearl necklaces can serve as the perfect finishing touch for a number of gorgeous bridal looks. Whether your bridal style is modern, contemporary or classic, bridal pearl necklaces are a fabulous way to elevate your look on your special day. 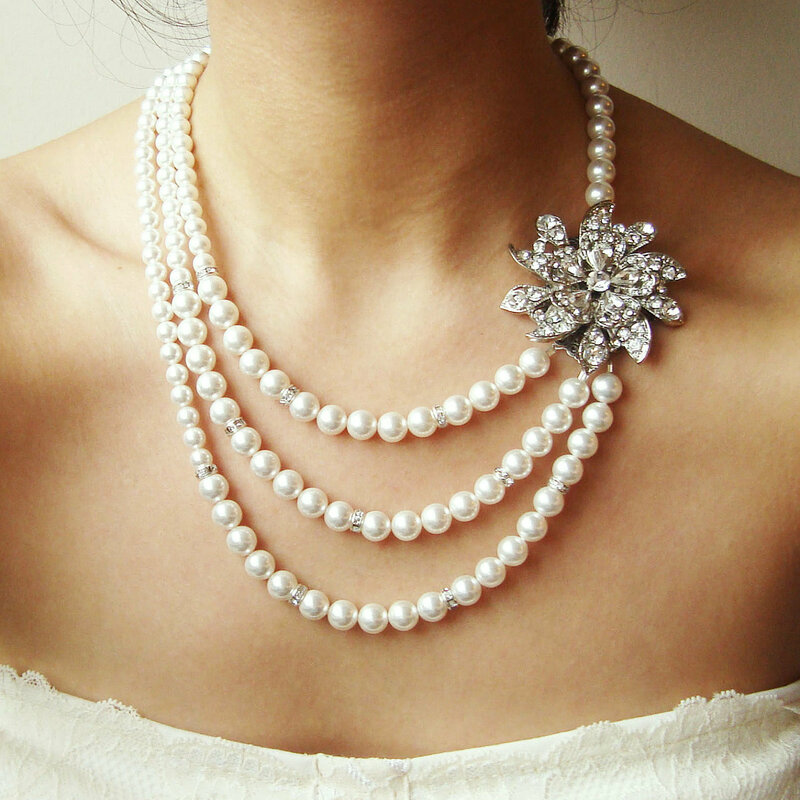 Wear a stunning pearl necklace with a strapless bridal gown, or use them to . Pair your pearl necklace with gorgeous pearl stud earrings or wear it on its own for a timeless look that’s as chic as it is elegant. Your wedding look is one of the most important ensembles you’ll ever wear, so it’s important to get it right! When dressing for your wedding, take care not to overdo it on the accessorizing. While it may be tempting to pile on your most precious gems for the occasion, your dress should take center stage, with jewelry meant to complement it, not overpower it. for elevating your look, but be sure to keep other pieces muted. A number of wedding dress silhouettes can be instantly elevated with a pearl necklace, including the always-popular V-neck. Whether mermaid style, trumpet or A-line, V-neck dresses paired with short pearl necklaces draw the eye upward, giving you a radiant look you’ll remember for a lifetime. Opt for small stud earrings, or a jeweled headpiece to create a fabulous pairing. Timeless in all their elegance, sweetheart necklines are ideal for both modern and classic brides. This style is easy complemented by short necklaces, so incorporate your favorite string of pearls and a pair of matching studs for a chic ensemble ideal for your big day. If you want something a bit more dramatic, layer pearl necklaces of different lengths, or choose a dramatic clasp that will be sure to get noticed. Perhaps the most popular among wedding dresses, strapless dresses are perfect for rocking with your favorite pearl necklace. The response was a essay writer softening of a view ms. Consider an updo and a colorful flower in your hair to take the look one step further into glam territory.